Meadow Grove Pond (Abstract). 8x10, oil on linen panel. 2015. 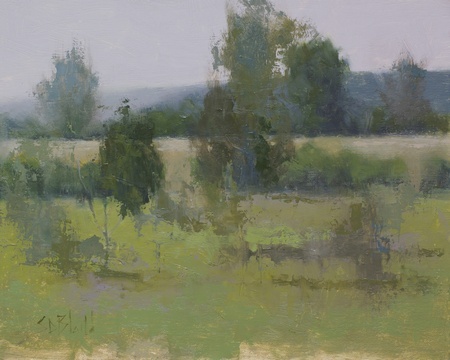 This little painting is based on a plein air painting I did at Meadow Grove Farm late in July. Actually, it's painted directly on top of the old painting. The new painting is done in two layers: a fairly dull layer where I created colors by mixing them into a range of four values of grays; and a more abstract layer painted on top of that (but not completely covering it) with a palette knife and brush. The pentimenti of the first layer creates some great effects in the outlines of the trees. The palette used was viridian, red, cad yellow medium and burnt sienna. All of the trees except the dark one in the back mid right are painted from imagination. Get information about events and special offers delivered to your inbox. I've recently done away with the comments section. If you have questions or comments, please contact me directly. Links from other blogs are always welcome.